The EC-7VAR Energy Logger is designed to Monitor and record energy usage on a 3-phase supply (or 3off Single-phase). The EC-7VAR also records the Power Factor to aid with the calculation of Real (W), Reactive Power (VAR) and apparent (VA) Power. Voltage Optimisation - This can help reduce Energy Costs significantly ! Many pieces of electrical equipment are capable of working at lower mains voltages, so by using Voltage optimisation systems to reduce the mains to lower levels where possible, savings can be made in energy usage. The first step in this process is to monitor the incoming voltage levels, for which the EC-7VAR is ideal. Power Factor (known as PF or Cos φ) is recorded for the voltage channel L1 and the current channel A1, this is then used to calculate the real (Watts), reactive (VARs) and apparent (VA) power for all 3 phases within our Electorosoft software. PF measurement also allows users to determine if Power Factor Correction is needed for the site. Easy Set-up using the included Windows based software. The stored data can be uploaded to the supplied Electrosoft software for further storage and analysis. Two input ranges are available on the unit (4-400A or 20A to 3kA) with 2 casing designs (standard IP43 or IP65). NOTE: Optional IP65 Casing is available under the "Recommendations Products" area below. Complete with Coils, fused Voltage Leads, USB lead & software. Allows rapid response to issues. Kit includes case, software, USB lead, input voltage leads, current transducer & user guide. 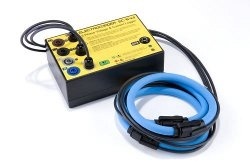 3x Voltage (leads with insulated crocodile clip) - True RMS Average, Minimum and Maximum. Also requires Neutral connection. Non-isolated. Batteries are primary cells, 6 x 1.5V AA-Cell Alkaline (IEC-LR6, ANSI/NEDA-15A). Logging life is unlimited with live voltage input connected. Immunity EN50082-2:1995, following the provisions of EMC directive 89/336/EEC. Recording std EN50160:1994.LVD 72/23/EEC with respect to EN60065. (IEC-61010). All models certified (light industrial, 3V/m).